Previous image, 42 total items. Next image, 42 total items. Expedia's Oakland vacation packages will help you save cash! Bundling your bookings will give you more cash to splash for your awesome adventure. Reserve your package deal on Expedia and save up to 40,450 YEN*. You can delay your vacation reservations with us because we do not charge cancellation fees for almost all of our bookings. Can't wait for your trip to Oakland? After some recommendations about what to do while you're there? That's what we're here for! Home to tourist attractions such as the University of California - Berkeley and the Greek Theater, there's never a boring moment in this bustling city. After you've finished looking around those, squeeze in a little more sightseeing at the Chabot Space and Science Center and the Berkeley Art Museum and Pacific Film Archive. Abandon your history journals! Let the past jump to life at Oakland Museum of California. There's an excellent range of things to keep you busy in this destination. Fancy a little motion picture magic? Catch a session at Paramount Theatre and get caught up in the cinematic experience, bag of popcorn in hand. Still have time to spare? Watch the clouds drifting along in the reflection of Lake Merritt. Its shimmering surface makes for a beautiful view — especially if you're there on a sunny day! It goes without saying that you don't take time off work just to sit in a small seat on a plane and sleep in a different bed. Traveling is all about the awesome adventures you have while you're there! If you'd like to take a look at a full list of activities, go to our Oakland things to do page. With as many as 67 properties in Oakland, finding a place to stay won't be a problem. But why wait around? Book early via Expedia and kick off your next cheap vacation or luxury getaway. Oakland's premium choices such as the Claremont Club & Spa - A Fairmont Hotel (41 Tunnel Road) and the Hotel Shattuck Plaza (2086 Allston Way) are sure to delight the most discerning visitor. If you don't really like shelling out such big bucks, why not spend your evenings somewhere more affordable? 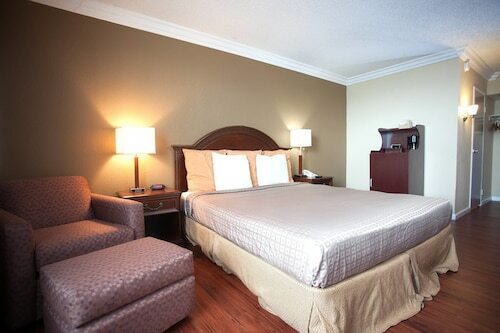 Take a look at the Inn at Temescal (3720 Telegraph Ave) or the Value Inn (370 W MacArthur Blvd). Working out the logistics of your trip to Oakland? Wondering where you'll be flying into? Oakland International Airport (OAK) will be the most convenient terminal. Once you've unbuckled your seatbelt and wandered out of the arrival gate, you'll be 7 miles (11 km) from the downtown area. Walk or jog around the lakeside path, rent a sailboat and relax on the water and enjoy bird-watching when you visit Oakland’s sparkling centerpiece. Shop, dine and stroll to your heart’s content in this waterside square, named after the novelist who spent his childhood here. Just outside Oakland, discover a natural oasis filled with towering redwoods, lush meadows, trickling brooks and miles of hiking trails. Watch alligators being fed, ride a train through the Australian outback and see a herd of elephants on the African savannah at this animal park. Come and see the ballet, a concert or a stand-up comedy performance at this spectacular art deco theater in the heart of Oakland. Peer at the night sky through antique and state-of-the-art telescopes and enjoy dazzling light shows at this superb space center. Delve into Californian history at this interdisciplinary museum, which features enthralling exhibits of landscape paintings, cultural artifacts and natural science under one roof. Located in the heart of Emeryville, this hotel is within 3 mi (5 km) of San Francisco Bay, Berkeley Marina, and Fox Theater. Paramount Theatre and Oakland City Center are also within 3 mi (5 km). Emeryville Station is 9 minutes by foot. Located in Downtown Oakland, this hotel is within a 15-minute walk of Jack London Square and Oakland Convention Center. Oakland City Center and Fox Theater are also within 1 mi (2 km). Oakland-Jack London Square Station is 6 minutes by foot and 12th St - Oakland City Center Station is 16 minutes. 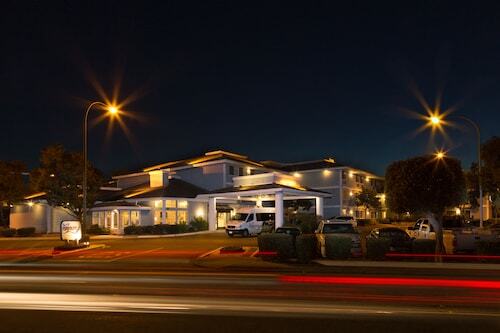 Situated near the airport, this hotel is within 3 mi (5 km) of Oakland-Alameda County Coliseum, Oracle Arena, and San Francisco Bay. Oakland Zoo is 3.1 mi (5 km) away. Coliseum-Oakland Airport Station is 22 minutes by foot and Coliseum Station is 22 minutes. 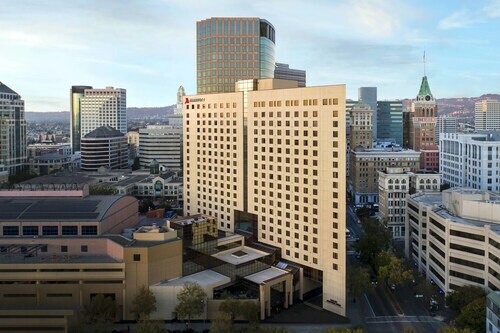 Oakland Marriott City Center is a 2-minute walk from Oakland Convention Center and 10 miles (16.1 km) from Oakland International Airport. Travel to downtown San Francisco is easy with the BART station only 2 blocks away, and it's less than a mile to waterfront dining at Jack London Square.